Most functions in Excel need arguments, or inputs. In particular, all database functions need arguments. You include these arguments inside parentheses. If a function needs more than one argument, you can separate arguments by using commas. For illustration purposes, here are a couple of example formulas that use simple functions. These aren’t database functions, by the way. You use the SUM function to sum, or add up, the values that you include as the function arguments. In the following example, these arguments are 2, 2, the value in cell A1, and the values stored in the worksheet range B3:G5. Here’s another example. The following AVERAGE function calculates the average, or arithmetic mean, of the values stored in the worksheet range B2:B100. Simply, that’s what functions do. They take your inputs and perform some calculation, such as a simple sum or a slightly more complicated average. How you enter a function-based formula into a cell depends on whether you’re familiar with how the function works — at least roughly. If you’re familiar with how a function works — or at the very least, you know its name — you can simply type an equals sign followed by the function name into the cell. SUM and AVERAGE are good examples of easy-to-remember function names. When you type that first parenthesis [(] after entering the full function name, Excel displays a pop-up ScreenTip that names the function arguments and shows their correct order. You can see how this looks in the case of the loan payment function, which is named PMT. If you point to the function name in the ScreenTip, Excel turns the function name into a hyperlink. 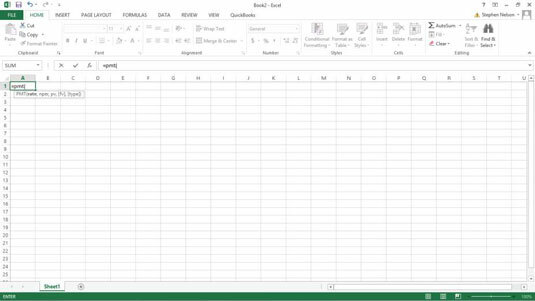 Click the hyperlink to open the Excel Help file and see its description and discussion of the function.